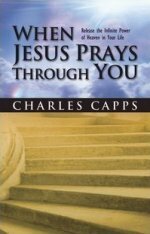 Description: When Jesus Prays Through You by Charles Capps. Release the Infinite Power of Heaven in Your Life. As a Christian, you have an Advocate in heaven. You have Jesus as your representative. In Jesus Our Intercessor, Charles Capps reveals powerful insights into your role in the present-day ministry of Jesus. This fresh look at intercession will change the way you think about praying in the Spirit. Discover in a compelling way why Jesus needs you to represent His power to your loved ones on earth. This scriptural journey will demonstrate that you are not on your own-you have Jesus as your intercessor. Dimensions: 5 1/2' x 8'1/2"